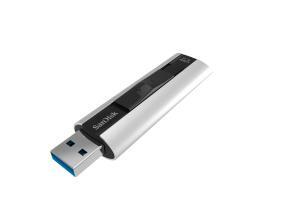 (1) Up to 240MB/s write speed to drive, up to 60 times faster than standard USB 2.0 drives (4MB/s); up to 260MB/s read speed. USB 3.0 port required. Based on internal testing; performance may be lower depending upon host device. 1MB=1,000,000 bytes. (2) Based on 1.2GB video transfer (MP4) and 3.6GB transfer of photos (avg. file 3.8MB) with USB 3.0 host device. Results may vary based on host device, file attributes and other factors. (3) 1GB=1,000,000,000 bytes. Actual user storage less. (4) Password protection uses 128-bit AES encryption and is supported by Windows XP, Windows Vista, Windows 7, Windows 8, and Mac OS X v10.5+ (software download required for Mac, see www.sandisk.com/secureaccess).